What a nice way to spend a Sunday morning or afternoon, baking this lovely cake. Your family will certainly enjoy this simple but "melt in the mouth" cake after a nice Sunday (or for any other night for that matter) dinner or supper. Also a wonderful cake to bring as dessert when you're invited by friends to be guests for dinner. Preheat oven to 325 degrees F (160 C). Generously grease and flour a 9 or 10-inch (23-25 cm) bundt or tube cake pan. Beat ALL ingredients in a large bowl with an electric mixer on low speed for 30 seconds. Beat on medium speed for 2 minutes. Pour batter into pan. Bake for 45-55 minutes or until toothpick inserted in center of cake comes out clean. Cool cake on rack for 15 minutes, remove from pan. Cool cake completely before dusting with confectioners' sugar. 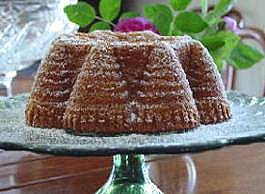 I made this pound cake in a 10-inch bundt pan made by Nordic Ware called the "Festival Bundt Pan". The presentation of this cake is very lovely if done in an attrative pan such as this. The Nordic Ware 10-inch "Festival Bundt Pan" can be purchased at gourmet cooking stores, online at Cooking.com, Amazon.com, Kitchenkrafts.com and at many other stores on the internet.